Mayan farmers in the states of Campeche and Quintana Roo have become players in the global chewing gum market with their unique and organic product. Sold under the brand Chicza Organic Rainforest Gum, the biodegradable chewing gum was launched in 2009 and has since expanded to 26 European countries, Canada and the United States. 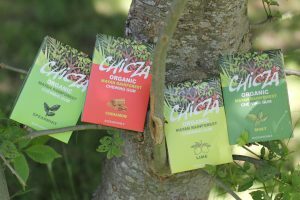 Introduced to the global market during BioFach 2009, the world’s largest trade fair for organic food, Chicza was chosen as one of the top 20 original products. Chicza is made from raw latex obtained from the sustainable harvest of the chicozapote tree by Consorcio Chiclero, an umbrella cooperative that brings together 40 groups representing some 2,000 small producers from the two southeastern states. The cooperative provides gum producers with social security, scholarships and other benefits, improving the quality of life of their families. The chicozapote, or Manilkara zapota, trees from which the latex is taken are located in a 1.3-million-hectare region of rainforest with organic certification. The cooperative produces 40 tonnes of flavored chewing gum annually, while an additional 100 tonnes of raw gum are exported every year to Japan and Singapore, which have been buying Campeche and Quintana Roo gum for over 100 years. The processed gum comes in five flavors, lime, cinnamon, mint, spearmint and mixed berry. With offices in Quintana Roo and the United Kingdom, Consorcio Chiclero oversees all stages of the production chain, from cultivation to distribution and exporting the finished product. CEO Manuel Alderete Terrazas says Chicza is proof that the private sector doesn’t have to be at odds with the environment.